Sam Shaw's iconic photos with Marilyn Monroe for The Seven Year Itch took place right where I stand! Normally I avoid doing famous vintage recreations, because I am personally not much of a costume-lover or cosplayer. (although much appreciation for all of the talent by those who are!) However, when Miss Retro Chic sent me the dress inspired by this very monumental moment in New York City, and the very grate she stood upon is right here in the city, I knew I had to take the opportunity to do something special. This is that famous grate on Lexington Ave, and I actually had no idea that MM had a beautiful view of the Chrysler building from where she stood! As the Wrights Food is now what I believe is a chain french restaurant, we decided to shoot with a view of the city instead of a matching angle. We actually were really happy with this decision, as the yellow taxis, Chrysler building, and later a coke truck seemed to complete our nostalgic 50's scene. This reproduction dress by Miss Retro Chic is really pure magic, and like stepping into an ethereal cloud of billowing ivory silk. 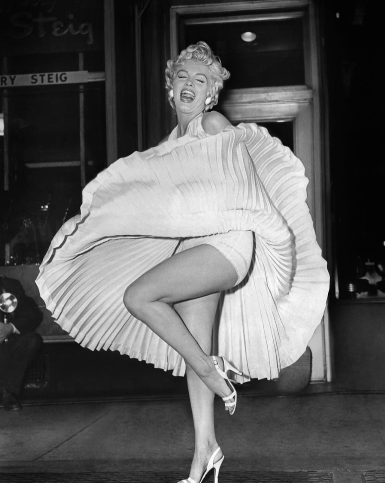 Not to forget, with halloween only 3 weeks away, this is your absolutely perfect dress for a Marilyn costume!